Cat Chat With Caren And Cody: Happy Mother's Day!!! 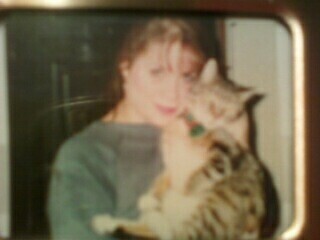 Bobo and I Pre-blonde days! I apologize for the poor photo quality!! What gorgeous four-legged children you have!!!! Cody and Dakota , You got a fabulous mommy !!!! I just love to say " Happy Mommy's Day to your mom "
Very true ! and the four legged never disappoint you ! The video is so hilarious and I love it!!! Fabulous lady with a fabulous song!!! Loving it!!! Happy Mother's Day to Cody and Dakota's mom!!! 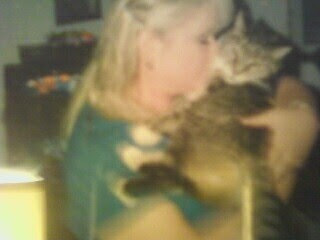 @Mr Puddy ((((((HUGS))))) BACK AT YOU! Thank you for being the ONLY hugs I have received!! I got NONE from Cody and Dakota!!! xoxoxoxo to your Mom on Mother's Day!!! @The Paw Relations thank you! you too! @Priscilla I am so glad you enjoyed the video because that is one of my faves!! I just love it! It is old but I love watching it every now and then. Put my feet up? Nope...doesn't work like that here lol I hope you have a FABULOUS Mother's Day! Do they celebrate it in Malaysia? @Gattina well...sometimes they do! lol. Mine are so far today! Happy Mother's Day to you. You are very special to Cody and Dakota, and to all of us! You are so beautiful and a lovely mommy! Happy Meowmmy Day to all!! They may be old pics but they are timeless and beautiful!! HAPPY MOTHER'S DAY!!!!!!!!!!!!! We have just looked at your picture with Bobo and we can see a definite likeness with Lucy there. She jumped up last night and caught me by surprise when she landed in my dinner!! I knew where she was hiding though as I had plenty of paw marks to follow - haha!! We wish your very special mom a very special and Happy Mother's Day. Oh Caren these pictures of you and your kids are so sweet. Happiness just radiates, from everybody. All y'all, as we say down here. Happy mothers day caren... Your children are very lucky creatures! I just did a quick "shout out" on Bocci' Beefs about your post yesterday on the Carol's Ferals FB promotion-hope it helps! And happy Mother's Day to you too! P.S. We'd be honored to have Bocci's Beefs on your blogroll, if you would be so kind:-) Thanks! @Benny and Lily THANK YOU!!!! Same to your Mommy! @Bocci THANK YOU!! That was soooo sweet of you!!! THANK YOU! I AM following you, I have been for quite some time. I thought my blog roll only shows those that have recently updated. Did I do something wrong? HELP! @Bocci ok I figured it out. I added you on...BUT...that list is NOT a list of every blog that I follow. For some reason it doesn't display every blog that I follow and I have no idea why. I follow you through Blogger I think and through email subscription. I follow (according to Blogger) 300 blogs and NO WAY are they all on that list :) I did fix it so that you ARE appearing! @Nadbugs THANK YOU sooo much! That is the best compliment! Happy Mother's Day! 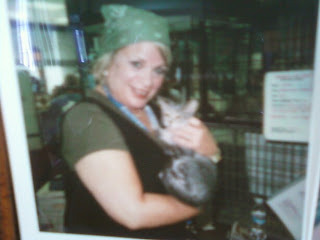 We're wishing your Mom a Happy Mommy Day from MomKat Trish and the crew at the Katnip Lounge! We have seen the video before but we MOL'ed at it all over again! Us Bad Cats like to run with scissors and other...bad...stuff. @mom2acat thank you! Happy Mother's Day to you! :D Happy Mother's Day to you! We all got a kick out of the video - too funny! Happy Mother's Day, Caren. What really neat photos you have to look back on. I hope you and your furrmily have a great day. Have a wonderful remainder of the day today. Mother's Day is really every day, but having a special day dedicated to it is nice. Hey now! Happy mother's day to you!!!! Ha ha ha... the mom song - a mom in a NUTSHELL, LOL! I ADORE all your images - so absolutely darling sweet. We are all four legged! Happy Mothers Day!!! Thanks so much for the sweet comment on my Mother's Day post Caren. I appreciate it. Hoping your day was special as well. Happy Mother's Day! Cody & Dakota lucked out in the Mom sweepstakes, MOL!! Happy Mother's Day Caren! Hope you had a wonderful day! @Cara Happy Mother's Day to you too! Glad you liked the video! @Jen Happy Mother's Day to you too!! @Fin, thank you! Happy Mother's Day to you too! @Gods Little People Awww thank you!!!!!! That was so nice of you! So glad you liked the video as well! @Mrs Tuna, happy mother's day to you too!! @Simba thank you dear one!! I soooo agree!!! 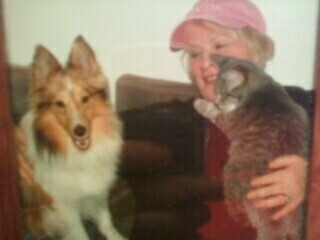 @Karen and the boys...."furmily" I love it! Glad you liked the photos! Hope your day was great too! We had very slow internet over the weekend (as we were mobile) as Mama had actually exceeded the quota for the month....har har har...so until the next bill payment time, it's hard to stay online at home. It's also difficult to bloghop and leave our pawprints at some blogs. So, we didn't get to wish you yesterday. So, here goes: HAPPY MOTHER'S DAY Aunty Caren! Hope Cody and Dakota treated you nice. purrr....meow! Mom had to work on Mother's Day so we are visiting a day late. Thanks for coming to Yoko's party. Hope your Mother's Day was fun. Beautiful photos, we hope you had a wonderful mothers day.